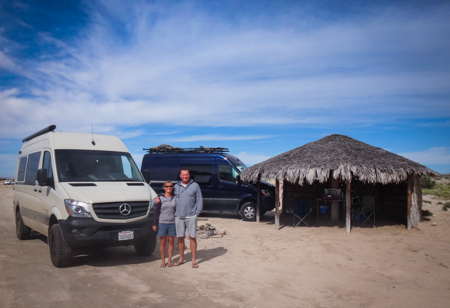 John and Shalena had driven to Bahia de Los Angeles from their home in Utah on as many dirt roads as they could find. 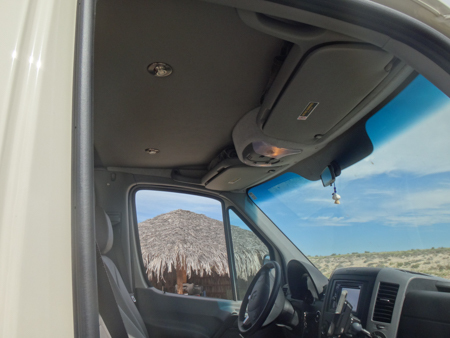 John has fitted their 4x4 high roof Sprinter for the desert. The color, an earthy grayish green, is perfect for dirt. He researched tires and found the largest that would fit were Cooper Discoverer S/T Maxx: 255 85R16. The spare was a little too big for the designated spot underneath so he had to modify the space by cutting the bars on the sides and flattening out the crossbar. Not easy but he's a welder. 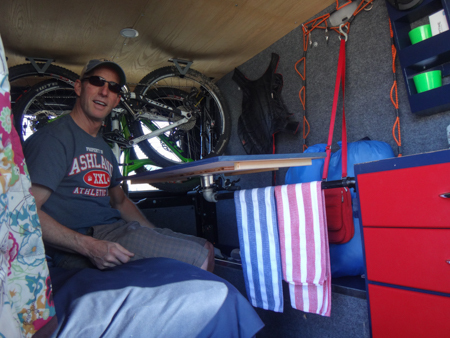 They travel with mountain bikes, SUPs and climbing gear so their van has to be versatile. Their bed is mounted high and it folds up against the wall for more room. 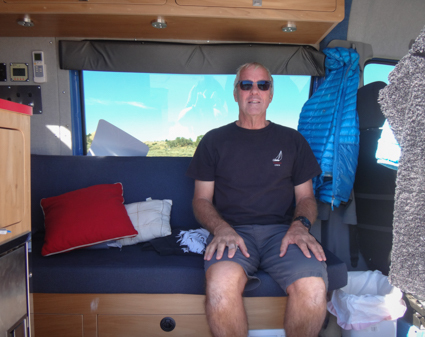 John was inspired by the outfitter, TouRig, and has high-end kit like an Isotherm fridge. 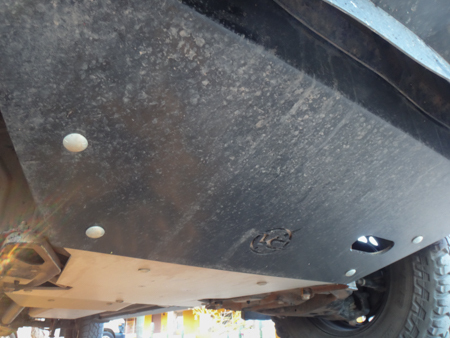 Skid plates from Van Compass are a must for the type of terrain they like to drive. It's interesting to see what's important to people. A place for shoes was critical for Cindy. I get it. 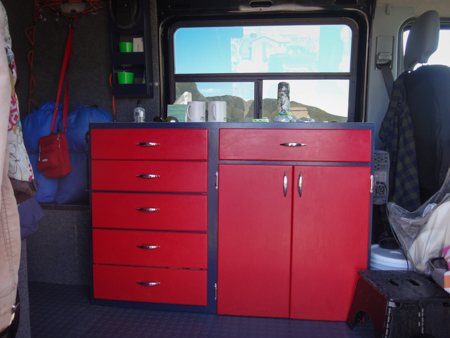 I had to convince Jim to make a big bin for shoes and boots in our van. Tom, on the other hand, wanted a simple, low profile open storage box for carrying extra fuel. 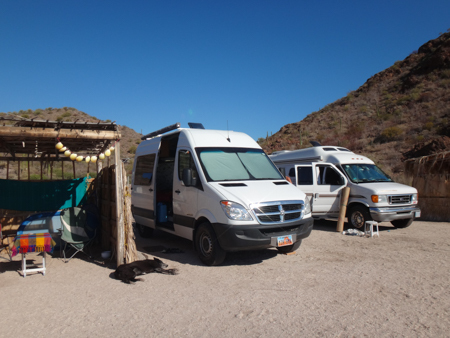 While Jim and I were having dinner in the restaurant at Laguna Ojo de Libre in Baja Sur, we met two other couples. 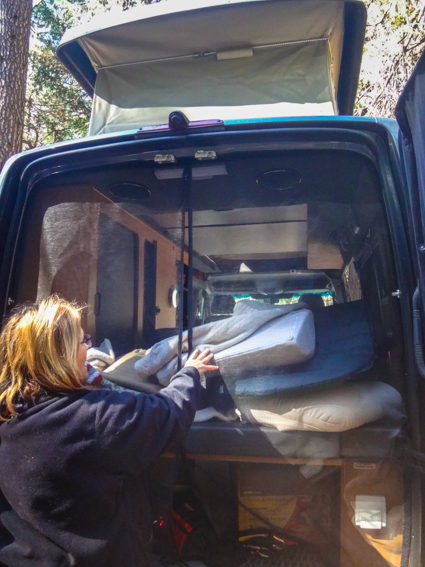 Turns out John and his wife have an older red high roof LWB Sprinter and Kathy and David have a buff colored Sportsmobile high roof Sprinter 4x4. We didn't get any photos of John's because I didn't have my camera. He'd just started fitting it out so it's still a shell, but he had two kayaks hanging side by side inside, and a Danforth anchor propped against the wall. We might steal the anchor idea. David and Kathy have the perfect color for Baja. Our navy blue van was filthy, theirs looked like it had just been detailed. 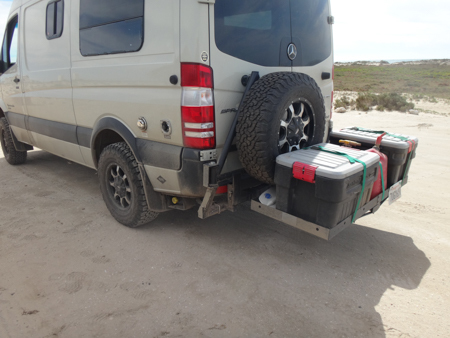 Because ULSD is nonexistent in Baja California Sur, we we curious how others dealt with with it. David's rack is big enough for two fuel cans and two bins for dirty truck stuff. Their interior was layed out differenly than other Sportsmobiles we've seen. 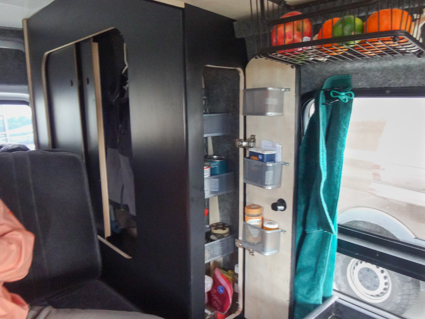 The sink and cooktop are on the side with the sliding door. 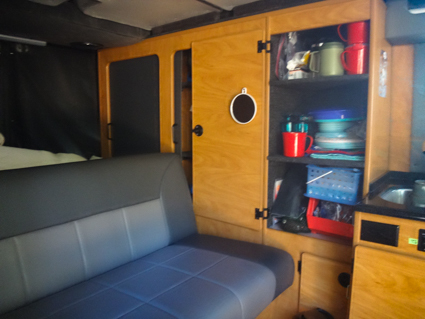 Across from it is the toilet/shower, and the couch that folds into a bed is aft with two bench seats, a microwave and plenty of storage. 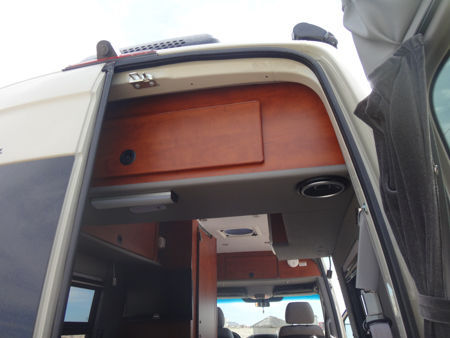 There is a big storage area above the bed that is accessible from either inside or when the rear doors are open. There's another enclosed storage area above the driver and passenger. Lights mounted below shine directly on each seat. 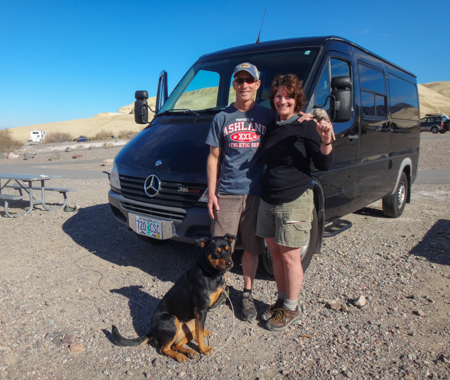 Derek and Kim were parked near us at Texas Springs Campground in Death Valley. 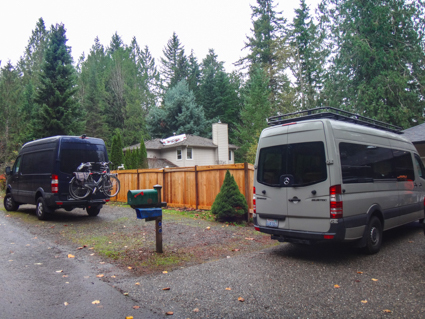 They were on their maiden voyage in their 2006 LWB Sprinter which had been a coffee delivery truck. 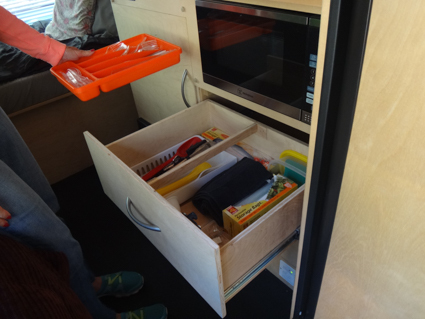 Derek repurposed a desk from a school demolition to use as their galley. Just cut it down to size, painted it red, and bolted it in. 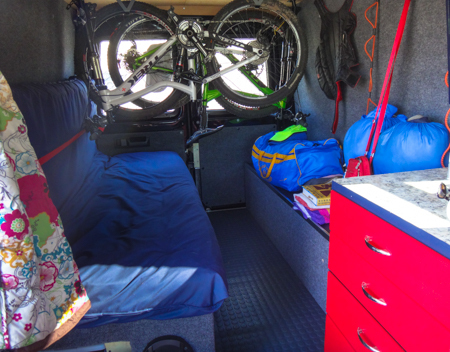 It's always interesting to see how people store their bikes inside and make the living space work. Derek and Kim hang their bikes upside down from the ceiling near the back doors and slide the futon below. During the day they push half up the wall and secure it with webbing to create a couch. Their table is brilliant. The arm is made from pipes and swivels and the table top is removable and easily stored. 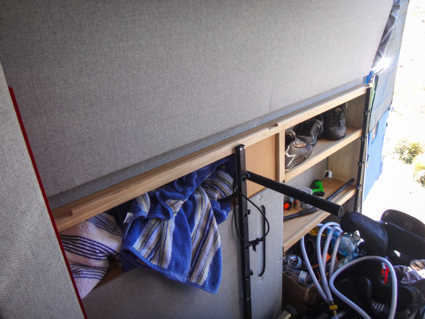 When it's put away, the arm doubles as a towel rack parallel to the galley fixture. 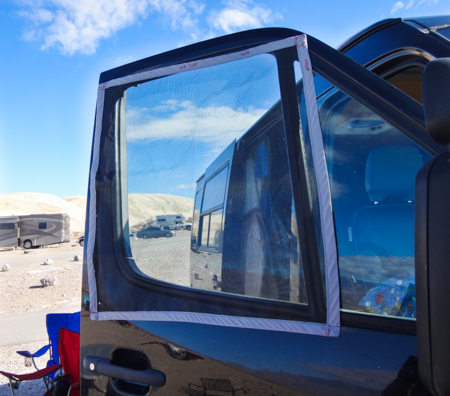 Their solution for bug screens on the windows is really simple and effective: Magnets are sewn into the corners of the binding and the screen is attached to the outside of the door. 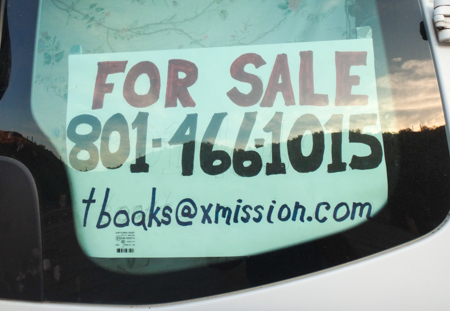 Then the windows can be rolled down easily. They take up hardly any space when stowed. 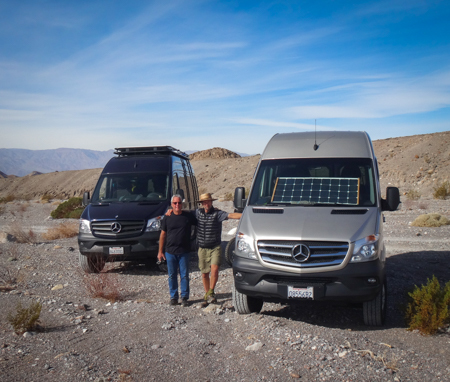 Mark was sitting in his 2016 4x4 Sprinter outside Furnace Creek Visitor's Center in Death Valley trying to figure out where to go when I saw it. I walked up, introduced myself, and said we had one too. Then I peeked in. Wow, he's a craftsman! Before long Jim had joined us and an hour had passed while talking all things Sprinter build. I wish I had more photos... Mark gave us the idea to put a shelf above the driver's and passenger's seats. 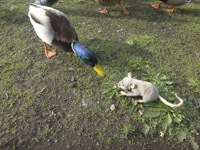 We hadn't seen that before. His looks really nice, ours will probably be more basic. 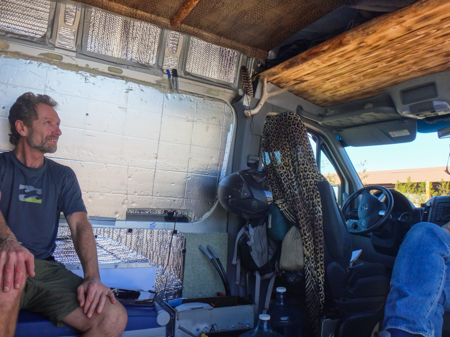 The coolest thing in his Sprinter, we thought, was the instant-on hot water that runs on propane. 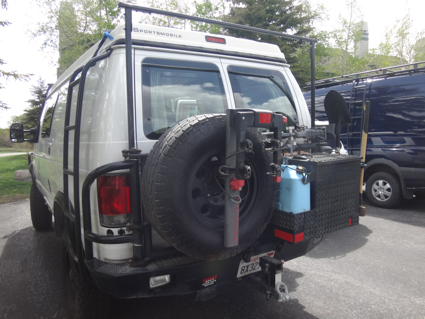 He mounted the tank under the van, just inside the back of the sliding door. 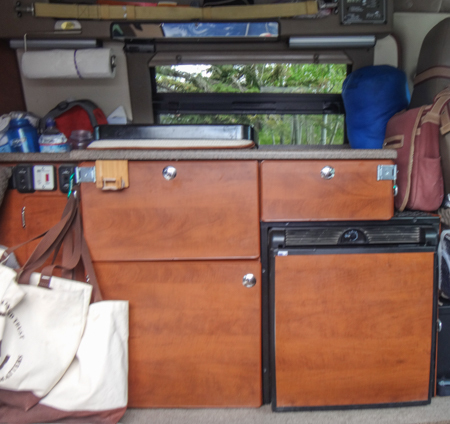 Orrin and Cindy's 4x4 Ford E-350 Pop-Top was the first Sportsmobile we'd ever seen when they took delivery in 2010. We thought it was a beautiful, beefy, beast - perfect for them, a little burly for us. 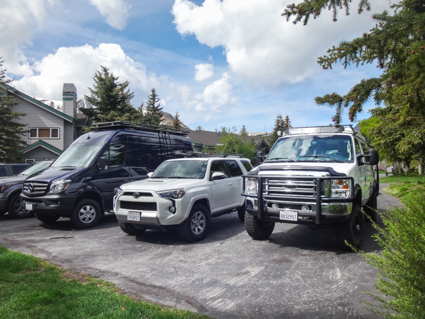 They have a history of 4x4 trucks and their daughters' first vehicles were Toyota Forerunners. We had a VW campervan and Audi Quattros before moving onto a sailboat. 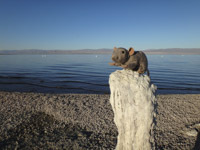 Orrin and Cindy spend weeks at a time off the grid in deserts, mountains, beaches and every habitat in-between. 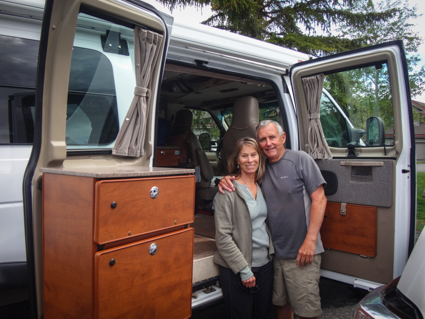 No Porta Potti, microwave, or inside shower for this life-long camping couple. 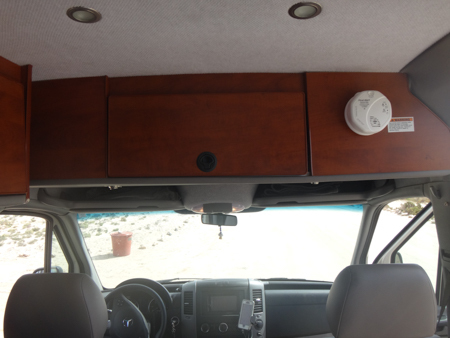 They've had to reinforce all the cupboards and drawers with straps because the original push latches pop open when driving on rough roads. 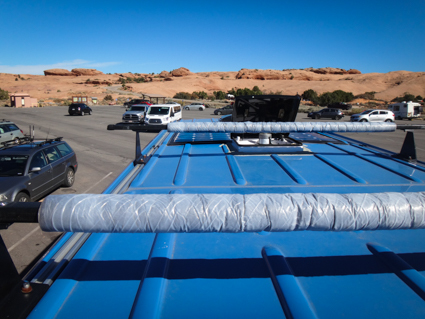 The awning rattles like crazy on the same type roads and doesn't work well in wind. If they had to do it again, they would not get it. 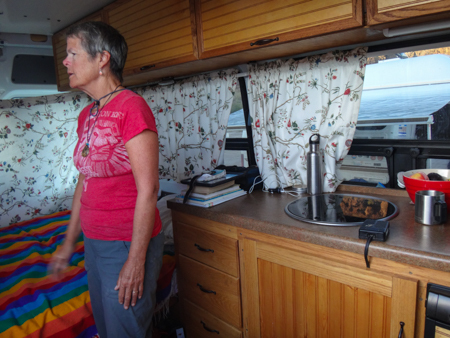 Cindy's favorite things: The upstairs where they sleep with plenty of airflow, the main floor configuration with easy access to the fridge, stove, sink and countertop, and the two-way blinds on the side windows that offer either shade or black-out. She's not fond of: The sliding closet door covered in fabric. It sticks. Also, the only way to hold the heavy seat cushion up to access the storage below is with her head. Their Aluminess back bumper holds tire chains and tools. 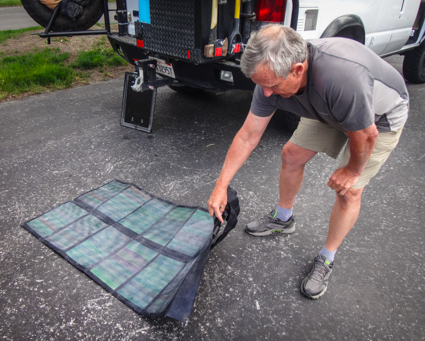 The box holds foldable Global Solar panels (62W) that plug into a spot under the port side rear light, and more tools. 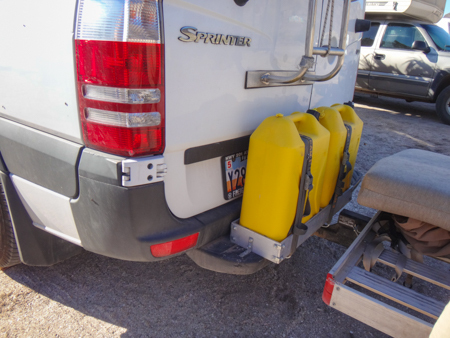 Orrin added a high bar to the bumper for kayaks. 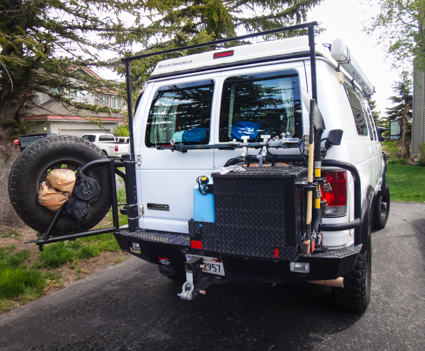 We like the second spare wheel mounted onto the swing gate. 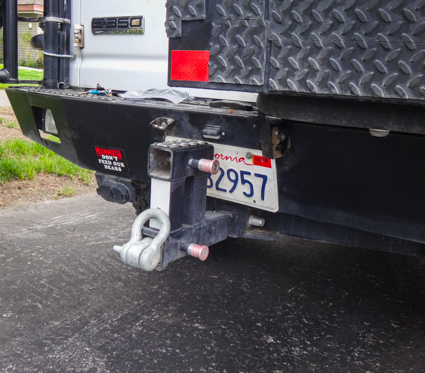 Although a hitch is available on the Aluminess bumper, Orrin bought a double hitch from Cabela's because it allows for more clearance. 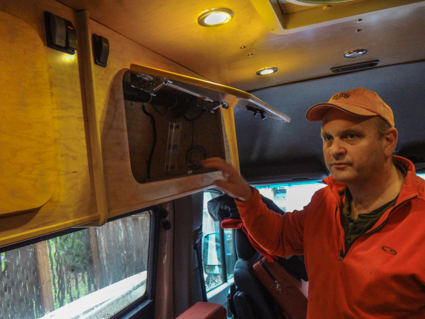 Hints from Orrin: Install a battery isolator to use any battery to start the van. A second fridge is nice and Dometic and ARB make energy efficient 12V/120V models. 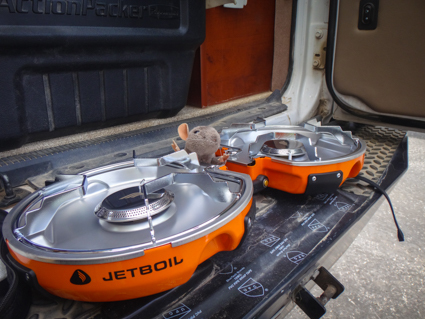 Most days they use a Camp Chef Outdoor Oven with 2 burners and they've added a small Jet Boil Base Camp 2 burner stove; both are propane. A light in the bumper and one on the rear quarter panel are useful. 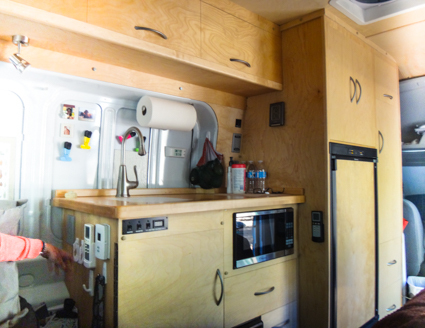 They have one water pump with hoses that go to the sink and the water heater in the back where their shower is located. Buy a locking Tuffy brand metal box for valuables. Cindy and Orrin are our daughter-in-law's parents. Does that make us all out-laws? 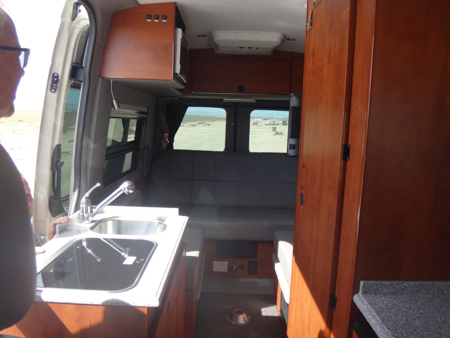 We share two toddler grandsons and after they bought their Sportsmobile, the kids bought a 4x4 RV. Jim and I needed an off-road capable camper then too, right? 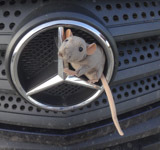 The little rat thinks it's a good idea. 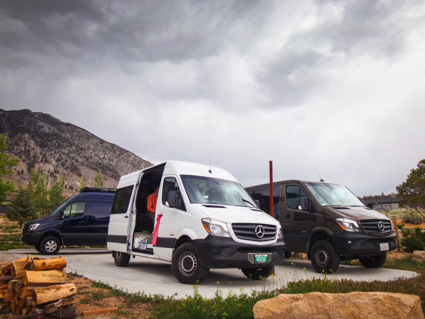 Shortly after settling into our site in North Pines campground in Yosemite, we spotted a Sportsmobile Sprinter pop-top nearby. 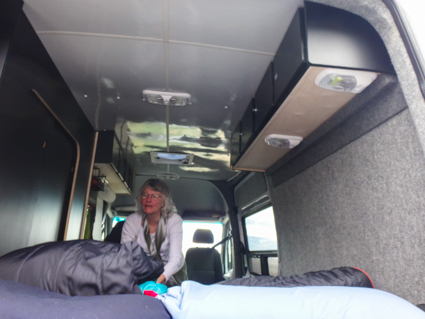 Next thing you know, Cynthia invites us to have a look and demonstrates how the couch folds into a bed, how well the black plastic latches and sliders on the drawers work, where the Porta Potti hides, and the thick, soft curtains that snap into place when closed. 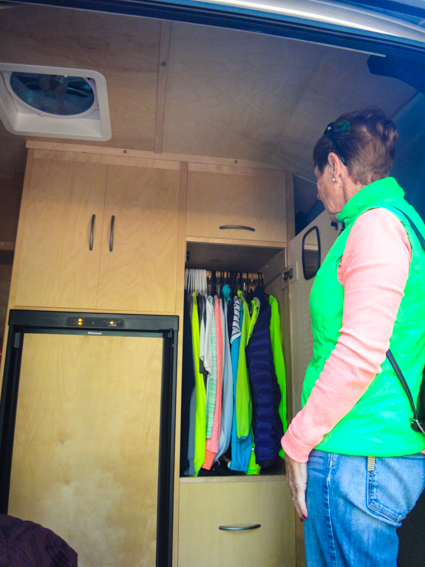 She loves the pop-top option for having friends aboard, the snap in bug screen for the back door and, well, everything about her 2015 Sportsmobile. 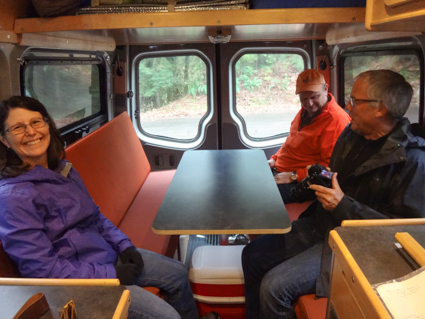 While we were looking at Cynthia's Sprinter Sportsmobile, Lance and Gabby came by. They are fitting out a high-top Ford Transit. Lance is a woodworker and their Baltic Birch cabinets are absolutely gorgeous. Their bunks are configured in an L shape with Gabby sleeping widthwise along the back. She loves her spot with brackets for her mobile phone, fan and heater controls. 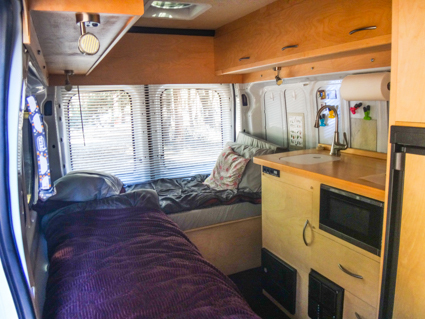 Lance sleeps lengthwise across from the long galley with a microwave, extra-large fridge (at Gabby's request), hanging closet, and a spot on the ground for their tiny port-a-potty. Although the countertop looks very nice, Gabby wanted Corian and now Lance agrees. It's too soft, he says. 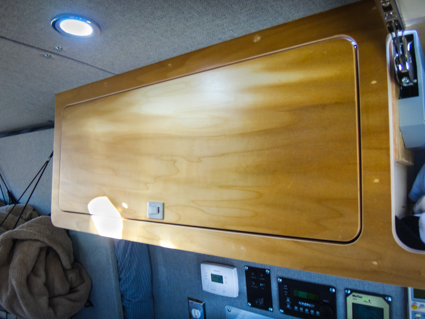 Gabby made window shades from Reflectix that attach with magnets. They are light and store away easily. She made a large one for the windshield too. Jim was involved in the Outdoor Industry his entire working life. In 1972 he started a company called Wilderness Experience. About the same time Steve Barker (brown Sprinter) started Eagle Creek. For decades, Smoky Anderson (white Sprinter) was a sales rep for Eagle Creek. Near Bishop, CA Smoky showed us his build-out. 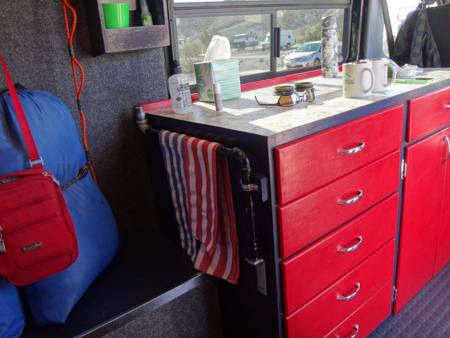 Smoky's design was similar to Sportsmobiles with a hanging closet next to the fold-down bed. 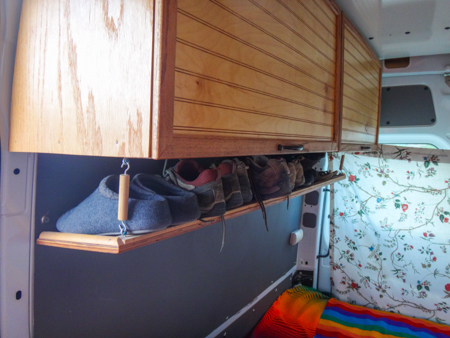 The bed and storage shelves below are assembled on a metal framing system called Unistrut. It's a simple, strong, very cool solution. 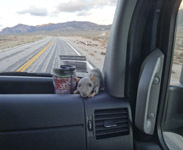 His walls are covered with Truckliner which is durable, soft, stretchy and inexpensive. Cindy loves the pantry Smoky built in the galley. Check it out! The fixed baskets under the high lockers are a great idea for fruit. 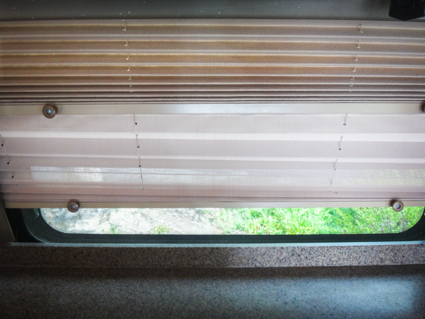 This is the first time we've seen a sliding door window with a vent. 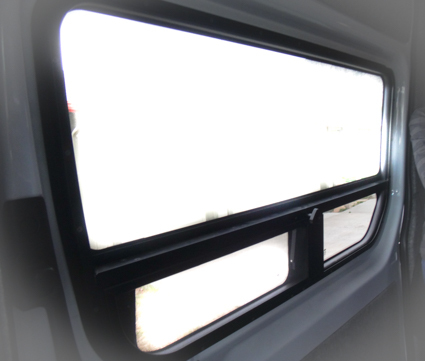 We need another source of fresh air for our FanTastic fan and this CRL window will do the trick. Slight deviation from Sprinters... We met Ian in the Chair 2 parking lot at Mammoth. 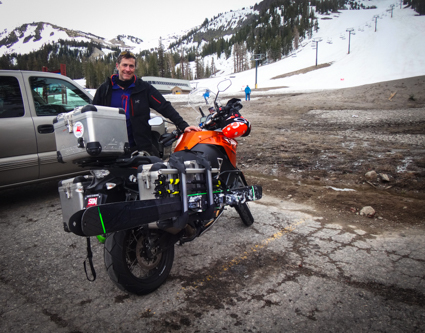 He is on a three week backcountry skiing trip, working his way down from the Cascades on his motorcycle. And we think we are traveling light. We met the Doyles in the Slickrock parking lot in Moab. 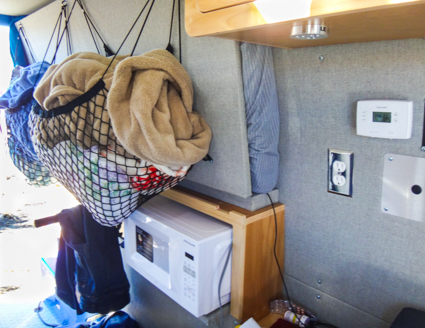 John designs kiteboarding gear for Slingshot and rigged a super simple rooftop rack. He glued his solar panel directly onto the roof to eliminate windage. He knows how wind works. 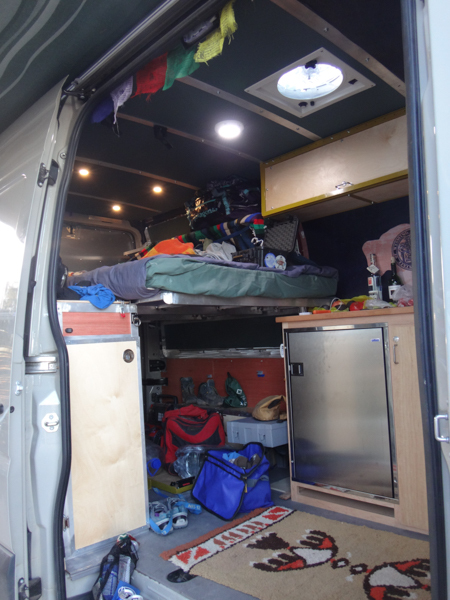 Because John and his wife travel with nice toys, they need to lock them inside their hightop, long wheelbase Sprinter. He designed their bed in two halves that fold up against the wall, mattresses and all. 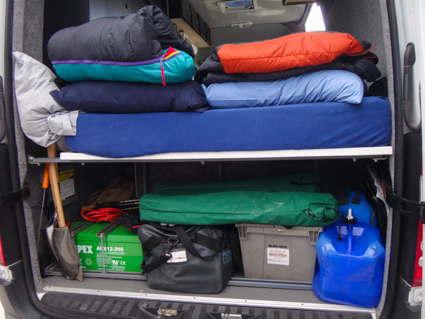 The bedding is stored in attached hammocks and there is storage beneath. What are their favorite bits of kit? The microwave and built-in shower! He designed the locker doors to open upward and lock in place. 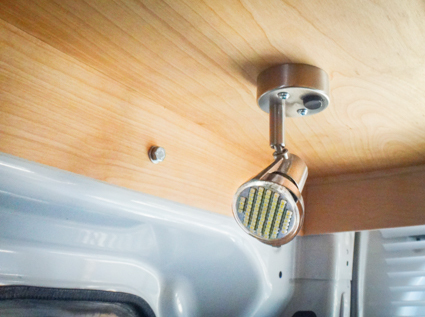 There are gaps between the doors and frames to eliminate squeaks when the van moves. John built a couch behind the swiveling seats. It's here they watch the pivoting flatscreen TV mounted above the sink by the sliding door. A removable table allows for dining inside during inclement weather. 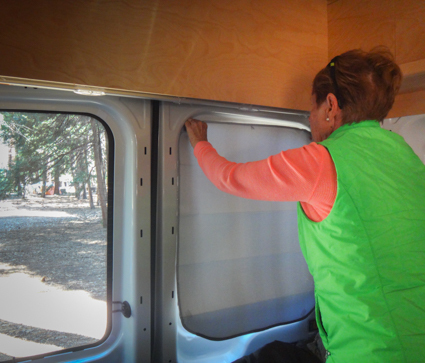 Their insulated window coverings fold up and snap into place. 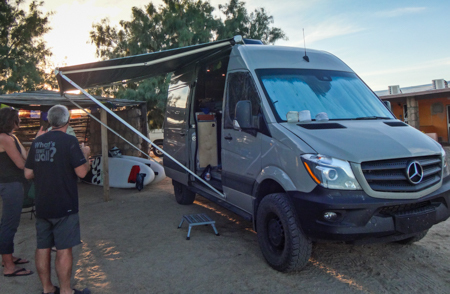 Kevin is a longtime friend and seeing his hightop, long wheelbase Sprinter a few years ago made us want one, albeit a shorter, easier to park version. 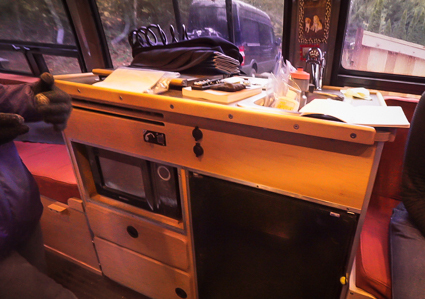 Our first road trip included a swing through the PNW to learn all about his build-out. 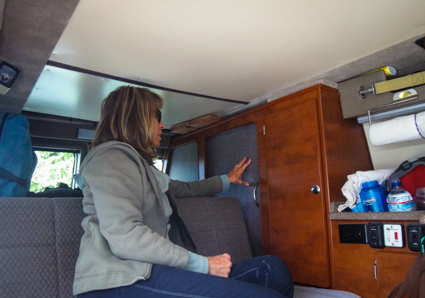 The galley runs fore and aft on both sides of the van which Janet really likes. Again, they love their microwave. A toilet and shower floor are hidden beneath a starboard counter. He designed the locker doors to rest on the outsides of the frames, a different solution to squeeking. 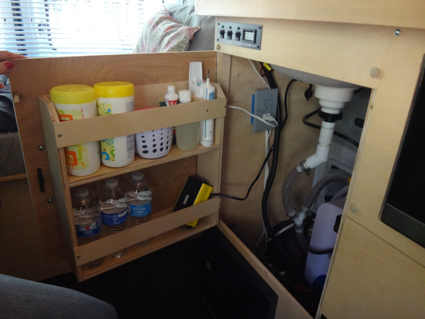 There is a water tank under a portside bunk. Often they have to fill it using jugs. His Aluminess rack is awesome! Besides looking cool, you can stand on it. 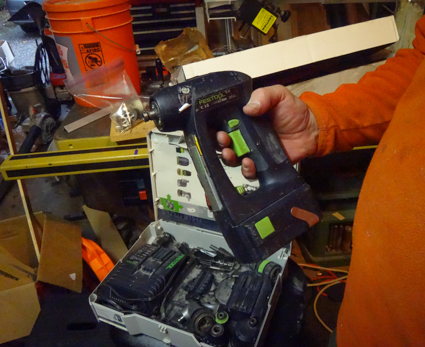 Advice from Kevin: Buy a Festool setup including the shopvac. Well worth the expense.